The EcoAir DC202 is a refrigerant dehumidifier with some interesting extra features. Most notably, it doubles as an air purifier as well as a regular dehumidifier – so it can be considered an “all in one” machine. But how well does this dehumidifier perform in the average UK house? And does the air purifier make a real difference to air quality? Keep reading our EcoAir DC202 review to find out! 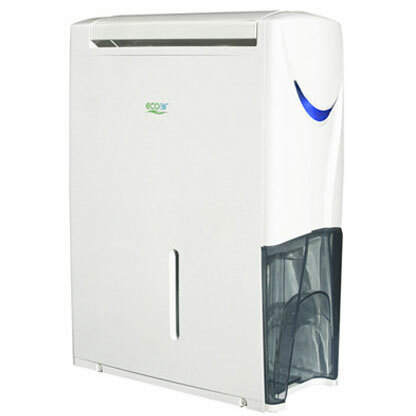 The EcoAir DC202 is a hybrid dehumidifier that also comes with a 5-stage air purification system. This means it leaves your air smelling fresher and cleaner rather than just removing moisture. It's not cheap, but we think it provides excellent value for money. Like most EcoAir products, the DC202 has a simple white colour scheme. This helps it blend into almost any environment, although the blue crescent on the front helps break up the solid white. It’s not quite as stylish as the DC12 though. The DC202 is a slightly unusual shape for a dehumidifier, with dimensions of 17.2 x 51.7 x 38.7 cm (W x H x D). It’s the thinnest we’ve reviewed so far, but it’s also tall and much deeper than most dehumidifiers. This is worth keeping in mind when you buy, as you’ll need to make sure you have the space available. The thin design makes it great for small laundry rooms though. Charcoal – this stage absorbs odours, so it’s great for homes with smokers or pets. Deodoriser – the air is then sent through a deodoriser to remove more bad odours. Anti-allergy filter – this stage gets rid of common allergens, including dust mites and pollen. Silver nano filter – this type of filter kills bacteria floating in the air. Ioniser – the final stage is an ioniser, which removes contaminating particles from the air. As a bonus, there’s the option of adding your own essential oil to a fragrance box. This all sounds impressive, but how effective is the filtration system compared to other air purifiers? It’s difficult to compare filtration systems without expensive lab equipment, but the DC202 should do a good job of removing odours and larger particles from the air. The lack of a HEPA filter, however, means that it’s not the most effective purifier for people with allergies. One thing to note is that the first three stages are part of the DC202’s “3-in-1” filter. According to EcoAir, this needs to be replaced at least once every 6 months. The nano filter can last up to 2 years. It’s important to note that the air purifier runs at the same time as the dehumidifier. This means the DC202 provides clean air at the same time as reducing humidity. There is a Purify mode if you just want the air purifier running though. The DC202 comes with a four litre water tank, which is large for a dehumidifier. This means you won’t need to empty it as often – which is important as it can quickly extract large amounts of water from the air. The water tank can be removed via the front of the machine. We like dehumidifiers that have a front loading tank, as you can empty them without moving the entire machine. There’s also a handy fold-down handle for carrying the water bucket and a level indicator on the side. As with most modern dehumidifiers, there’s the option of using a hose for continuous drainage. As we mentioned, the dimensions of the DC202 mean it’s deeper and taller than most dehumidifiers. This can make it awkward to carry, although at 10.7kg it’s not the heaviest on the market. The good news is there is a built-in handle. We prefer these to indents for holding, as they make it easier to carry the dehumidifier around the house. There are also small wheels. The EcoAir DC202 does a good job of removing moisture on the air. It’s not the fastest dehumidifier on the market, especially at low temperatures, but it has a high maximum extraction capacity of 20 litres per day. Keep in mind that this is a refrigerant dehumidifier. This type works best in warmer conditions, as there needs to be a temperature difference between the coils and surrounding air. For this reason, it’ll extract water much faster in warmer temperatures. It also won’t work at all below 5 degrees Celsius, as this is when the automatic defrost function kicks in. The DC202 comes with a built-in humidity sensor. This monitors the surrounding humidity and switches off the machine when it’s reached, before switching it back on when required. It doesn’t use exact humidity, but allows you to choose in ranges of 10%. There are also three louvre settings. This includes an extra wide 140 degree setting for when you need to dry laundry. The DC202 is a powerful machine with a high 20 litre/day extraction capacity. For this reason, it’s suitable as a whole house dehumidifier with up to 5 bedrooms. EcoAir rates the DC202 as having a noise output of 45dB, which is fairly noisy – although it’s not unbearable and certainly not the loudest we’ve seen from a refrigerant model. For comparison, the DC12 has a 43dB noise output and DC18 has 45dB. Even so, if you want a quiet dehumidifier for using while you watch the TV, this might not be the best choice. One area the DC202 lags behind other dehumidifiers is energy consumption. It’s rated at 318W, which is considerably higher than many other refrigerant models. There are a few reasons for this though. The first is the extra filtration systems. While some of the layers don’t require energy to run, it’s reasonable for the overall system to increase power consumption. It’s also a powerful dehumidifier with a high 20 litre/day extraction capacity. With that said, it’s far from the most energy efficient on the market. The humidity sensor and automatic shut-off function help keep the energy consumption down though. There are three modes – dry (which is the basic dehumidifier mode), laundry (for quickly drying laundry) and purify (for using the 5-stage purification system on its own). The ioniser runs in all three of these modes. The dehumidifier will also automatically shut down when the water tank is full. While you’ll need to read the manual to make the most of all the settings, the DC202 is simple to use and largely self-explanatory. The buttons are divided into four categories. The first is for the timer, with settings for 2, 4, 8 and 12 hours. These allow you to turn on the dehumidifier for a set period without worrying about it using energy indefinitely. As you would expect, the DC202 has a humidity sensor so you can choose between three levels of target humidity. The three options correspond to 40-50%, 50-60% and 60-70% humidity. The other two sections control the air outlet and the mode. The latter lets you choose between Dry, Laundry and Purity modes. The first two modes are standard for most dehumidifiers, but it’s great to have the option of using the air purifier on its own. There are also two fan speeds, so you can reduce the noise output at the expense of extraction rate. The side of the machine has indicator lights for when the machine is defrosting or full. Note: For more information about the EcoAir DC202’s control panel, you can view the manual here. 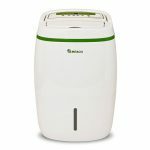 The EcoAir DC202 is one of the more expensive dehumidifiers on the market, with an RRP of nearly £270. However, we think it still provides value for money due to its fast extraction and easy-to-use design. This is why we rated it as one of the top 10 best dehumidifiers in the UK. Its air purification system, which is far more effective than most dehumidifiers, is another reason why spending extra to buy the DC202 could make sense. If you’re not interested in an air filter, then a cheaper option may be a better choice though. The EcoAir Hybrid DC202 is an excellent dehumidifier – and the additional air purification system also does a great job. If you love the thought of the air in your home being less humid and cleaner, then it’s definitely an option to consider. In fact, the only real downside is the price. While it’s expensive, the DC202 is simple to use, great at extracting water and easy to empty. So if you’re willing to spend the money, we don’t think you’ll be disappointed. 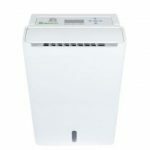 We hope this EcoAir DC202 review has helped you decide whether it’s the right dehumidifier for your home. If you have any questions, feel free to ask and we’ll do our best to help!